This article chronicles the career of versatile Dan Gurney, one of the greatest race drivers the United States ever produced. A true force in Formula One's golden years, Gurney did something no other driver had ever done and likely never will do again - win a grand prix in an American-built car he designed. This was the Belgium GP in 1967. But there was much more to Dan Gurney. Like his contemporaries Mario Andretti and A.J. Foyt, Gurney won races in IndyCar, NASCAR and sports cars. He won at Le Mans, in Can-Am and in NASCAR at his favorite track, Riverside, California. This story chronicles the beginnings of the racing culture in the Daytona-Ormond community in Florida from 1903 through 1910. In a time when American roads were little more than craggy pathways, the unique sands of Daytona-Ormond at the edge of the shore were smooth as glass when tide receded. This is the story of the Indianapolis Motor Speedway's busiest year for events - 1910. Carl Fisher and his partners A.C. This is the story of nearly forgotten 1916 Harvest Classic - almost a footnote in the history of the Indianapolis Motor Speedway. As America prepared for war, Speedway President Carl Fisher knew that he may need to curtail operations at the track as the country weathered WWI. This article appeared in the 2005 Indianapolis Motor Speedway Allstate 400 program. It recounts the brave drive of 17-year-old Charlie Merz and co-driver "Jap" Clemens. In a giant trophy case at the Indianapolis Motor Speedway Hall of Fame Museum sits an impressive collection of trophies from the best among 1930's Grand Prix drivers: Rudi Caracciola. Caracciola led a life of triumph and tragedy. With Tazio Nuvolari, they stood as the giant driving talents of Europe in the years immediately prior to World War II. Winning the European Grand Prix championship several times, Caracciola collected sterling silver trophies of all variety: clocks, loving cups, platters and more. His lows were as devastating as his victories were stellar. This is the story of America's first international road race, the 1904 Vanderbilt Cup. Commissioned by William K. Vanderbilt Jr., the millionaire scion of one of America's richest families, this was the first major road race held in the United States. 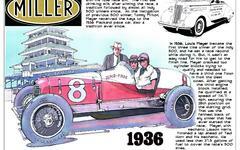 This is the story of the first of Wilbur Shaw's three Indianapolis 500 victories in 1937. Driving what he called his "pay" car, a machine he designed and built himself, local boy Shaw won what would prove to be the Indy 500's closest finish for 45 years. He narrowly beat Ralph Hepburn by little more than two seconds on a hot, sunny day. The finish remains among the top ten closest in the Indy 500 history, and the only one on that list that occurred before 1982. The attached article you can click thru to below is the compelling story of Hall-of-Fame driver Johnny Aitken, the man who won more races at the Indianapolis Motor Speedway than any other racer. I wrote this piece for the 2018 Indianapolis 500 program and it is an important tribute to a talented competitor whose story has been all but swept away by the passage of time.